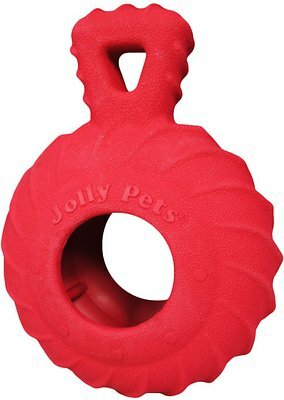 The Jolly Pets Tuff Treader Dog Toy features a clever design that’s similar to the ever-popular Jolly Ball, but in a treaded tire form. This durable chew toy is made from a specially formulated “tuff” blend of thick natural rubber to keep determined chewers mesmerized. The unique raised tire tread surface helps clean your doggy’s teeth as he enjoys gnawing on the toy. You can even stuff the deep grooves with his favorite treat to keep him coming back for more. 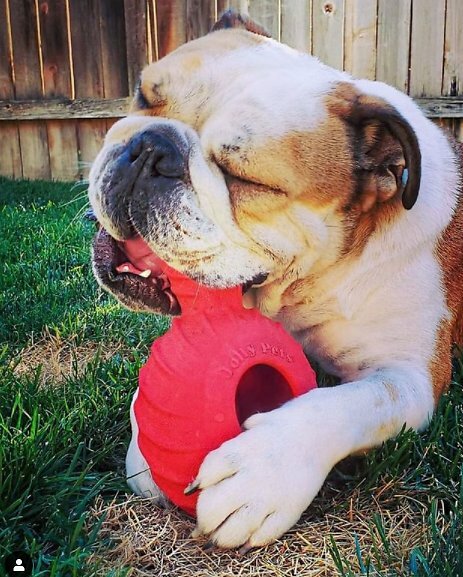 Interactive durable chew toys that are made from all natural, thick and durable rubber are sure to be a hit with you furry friend. Raised surfaces help clean your dog’s teeth as they chew, aiding in oral health and maintenance. Teeters or topples for maximum fun. Try using this for fetch and you'll have you pup worn out in no time. This lasted almost 2 years for my extreme chewer. His gnawing on the handle finally wore through. We would line the inside with cheese spread or peanut butter to get him more interested in the tire to take his attention from the handle. Definitely, helped him through storms and fireworks for attention and mental calmness for his fears. Easy to clean the treads with a toothbrush. He carried this toy on walks on high anxiety days. Easy to toss in the house. It’s built strong. Glad I found this again to buy. No interest at all from my aussie. It's merely a home accent now. (I leave it outside so people know I have a dog). Other than that it's a quality toy that smells like coconut oil and holds up to the desert environment it now occupies. If it was chewed on my medium chewer would have this toy for a long time. My voracious cairn chewer has not broken through this toy yet after 2 hard weeks of play, even though I thought it was the weakest link in the new toys. I did put it away for a rest because he thinks he has figured out how to destroy it. We shall see. I bought this for the dogs at the shelter where I volunteer. They love it and it seems to last longer for our tough chewers than many other toys. I have a 16 month pitbull that has never met a chew toy he couldn't destroy...until this one. Seriously, it's been 2 days and everything is intact! We can't believe it! I'm definitely adding more Jolly Pets toys, especially the Jolly Tuff line which is guaranteed, to my basket next shopping trip! I wish I could share this to all my pittie friends on FB! I'm sold!! Jolly Pets Tuff Treader Toy is the Only Toy have ever gotten that Our Basset Hound hasn't Chewed-Up. This Tuff is keeping our pups interest and so far he hasn’t destroyed it. He likes to hold the larger part and chew the handle. My Rottie was immediately interested in this toy. Unfortunately, it only took him 30 minutes to chew the top handle part off. The good news is that it was probably equal to a month of brushing his teeth! I'd buy him one a week just for that. I don't know if he'll lose interest now or still like chewing the remaining tire part. My one year old rescue is one tough girl. She destroys every toy given to her. This one is holding up fabulously. I did what another reviewer recommended and put a tennis ball in the middle. It takes her quite a long time to get the ball out, thereby giving me a much needed break! And it has lasted over 2 months, which is a big win in my house.